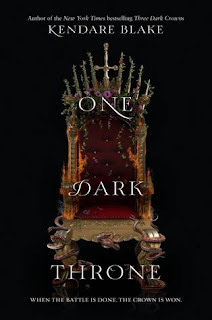 One Dark Throne is book 2 in the Three Dark Crowns series. I really enjoyed book 1 and knew I had to grab this installment. This series is about triplet girls that hit the age where they're going to battle it out to be crowned queen. Each book has a round-robin type POV style, we cycle through each of the sisters POV and learn what they're doing. The last installment left off right before the batteling would begin so I figured this book would be a bit darker and boy was I right. A little recap in case you haven't read the series or forgot already. First up in the sisters is Mirabella who is an elemental that controls the elements, she also happens to be the strongest of the bunch and everyone assumes she'll be crowned queen. Next up we have Katharine, she's a poisoner that is able to handle the deadliest of poisons. She's not exactly strong though and winds up sick whenever she's in contact with a poison. Lastly, we have Arsinoe, a naturalist. Naturalists are able to make things blossom as well as have an animal familiar. She's also rather weak in her powers and no one thinks she'll win the battle. We find out a juicy tidbit at the end of book one about Arsinoe, but I won't share that since it's a huge spoiler. In this novel, we're mainly gearing up towards the girls attacking one another and we do get to see some of that in action. The sisters are playing dirty and also calling one another out for duels, it really kept me on my toes and I had no clue what would happen next. I will let you know the ending has me wondering where the author is going to take this series, it was a rather unexpected ending but not in a bad way. 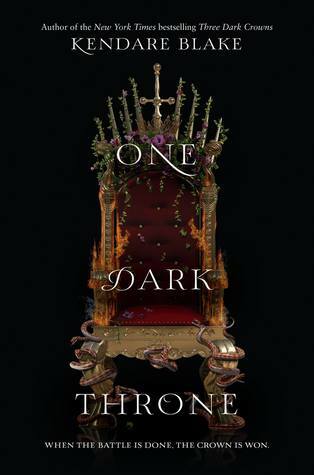 One Dark Throne takes you on a journey you won't want to put down. I really enjoyed this sequel and cannot wait for the next book. I'm really digging the author's writing style, it's detail-rich but doesn't slow down the pace of the novel. The round-robin type POV shifts is a really nice touch since you're able to see each sister's daily lives and how they're gearing up for killing each other. If you couldn't guess, this series is a dark young adult fantasy, if that's not your cup of tea you probably won't enjoy it. If you're a fan of darker reads you'll adore this series and I can't recommend it enough. I usually like YA dark fantasy but sadly I did not enjoy Three Dark Crowns. Too much blah going on in terms of romance (for me). I got an ARC of this book but sadly I don't think I'll be reading it. If it were a duology then yes, but given that it is part of a quartet, I'll pass. I did take a peek at the ending though. I'm with Jules!!! I have never ventured into the dark fantasy world. This sounds like you had a great time. I really want to read the first book because it's dark YA fantasy. You know, if I ever get around to reading it. I have too many books on my TBR. Nopeeeeeeee, it's 4 books I'm pretty sure.